(WINDSOR, ON) – With Omar Strong out of the lineup Friday evening, the Windsor Express welcomed the Saint John Riptide into their house for the celebration of LaSalle Night. With lead singer Joe Coccimiglio of the Autumn Kings performing the National Anthem, the turnout of nearly 2,000 expected a good show from the Express. They weren’t disappointed. Windsor opened the game with two treys and a jumper, but were matched point-for-point by Saint John. Another triple by Logan Stutz coupled with a similar shot from Maurice Jones provided the impetus for Riptide head coach Nelson Terroba to expend an early timeout. Dropping bombs from outside became regular occurrence for the Express on the evening. The Express were showing better ball movement in the 1st quarter than they have in recent games. They worked for their points while Saint John seemed to rely on broken plays and freebies from the line. As a result, the teams ran to the buzzer with just 4 points separating them, 28-24 to Windsor’s advantage. Top scorers in the quarter were the Riptide’s Aly Ahmed and Stutz and Jones of the Express, all tied with 9 points. Shooting guard Braylon Rayson wowed Windsor fans to open the 2nd period when he knocked down a jumper from deep beyond the arc. On a pass from Chad Frazier, Rayson repeated the feat moments later. The crowd went wild when Stutz got in on the act with a bomb of his own. The outburst stretched the Windsor lead to 12 points by the 7:55 mark. Forward Sefton Barrett made it 16 points when he converted a fast break for 2 points, and touched down in the first row of the expensive seats. By the horn, the Riptide had scratched their way back to within 11 points as Windsor led 58-47 at the half. More at home battling in the paint, Stutz was top dog over the first two quarters with 17 points on the strength of an uncharacteristic 5-for-6 from outside. Rayson was right behind him with 12 points off the bench for Windsor. Fans also witnessed the transformation of Jones from a point guard to a shooting guard as he dropped 3-for-4 from beyond the arc and 4-of-7 from the field. The Express came out of the dressing room for the 2nd half to meet their nemesis, that being the 3rd quarter. All season Windsor has had difficulty with maintaining their momentum past the first 24 minutes. Saint John was able to draw within 4 points of the Express more than once during the period, but Windsor didn’t loose their collective head and finished out the quarter with an 8-point lead, 85-77. The Express did lose the services of Kevin Loiselle during the 3rd quarter. In a freak incident at the Riptide baseline, Loiselle suffered a severe upper body injury which will make him extremely unlikely to dress for tonight’s home match with St John’s. Windsor was the first team to reach the 100-point plateau as Frazier dropped a smooth three followed by Rayson with one of his own before Terroba called a time out to stem the bleeding. The benchmark re-established a 16-point margin between the front running Express and the Riptide, but Coach Jones wasn’t ready t breathe easy just yet. Coming back from the rest-stop Barrett knocked down a triple to greet the visitors as they returned to the court. He doubled down with a follow up trey on a dish from Frazier. Then Rayson hit for three and sealed the game for Windsor with 1:55 on the clock. And, Jones completed his 7-for-9 from downtown with 58 seconds to go. The final was 121-108. 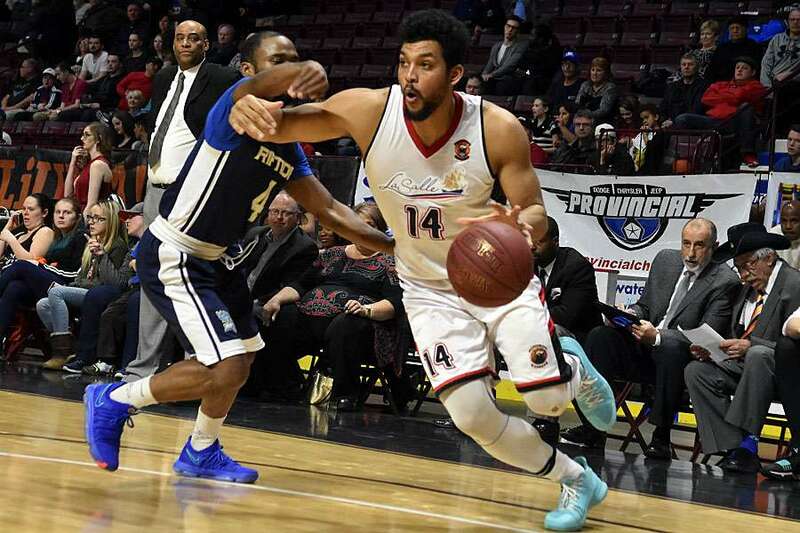 The loss dropped Saint John a half-game behind the 3rd place Island Storm and continued hope for Cape Breton, who trail the Riptide by 5 games with six remaining to play. In the Central Division, Windsor (18-16), currently in 3rd pace, is still in the hunt to improve their standing. The win allowed the Express to pull within 3.5 games of both St John’s and London, who share identical 22-13 records. Windsor holds their own fate as they play the Edge tonight at 7pm and have back-to-back, home-and-away games against London on March 25 and 28.